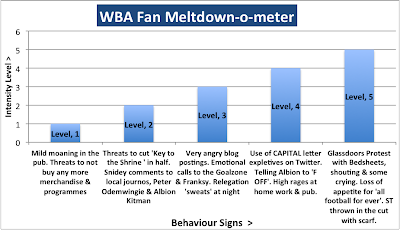 I don't do seething or at least I try not to certainly about events that are totally and utterly beyond my control and as such I think the most I have ever mustered on the fan meltdown-o-meter was a one which was back in the days of Gould when the Baggies fans in general were off the scale. Maybe I view current events through that prism and cannot get worked up about an owner who is reluctant to spend money on transfer fees while the team is in the Premier League and enjoying sustained success. I know I am in the minority that looks at the bloated fees in the English transfer market sees no value just risk and is quite happy that the club has been extremely cautious in a market that makes tulip mania seem rational, it can only end in tears all bubbles do. However at the death two hefty fees (for WBA) were paid for Anichebe and Sessegnon however I am reliably informed by the legion of Football Manager experts that they are wrong big money singings. 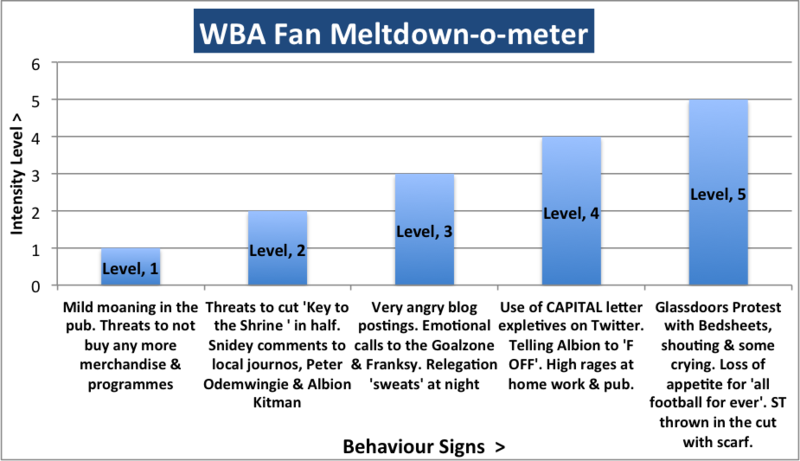 So maybe I should join them at meltdown level 3 or more likely I won't. Across the summer we have increased the squad size so it is hard to argue from a purely numerical perspective that the squad is any weaker than last season. From a perspective of quality and balance that remains to be seen I won't rush to judgement either way. Too often players with burgeoning reputations have arrived only to disappoint whereas more modest signings have flourished so the jury ought to be out. Those fans who wanted the club to splash the cash are disappointed and many are rubbishing the new signings to prove their point that a transfer fee somehow reflects the quality of the player, it does not. Personally I would have liked the club to seize the initiative this summer and overhaul the squad by trading some of the senior players whose form dipped in the second half of the year and used the funds to bring in a new generation of players. However it was not to be and given that I don't run the club my opinion counts for very little so there is no point in working myself into a lather over it. The media is obsessed with the transfer window and whether it is the idiot Franks on radio WM whipping up a storm or the over hyped Sky Sports News understanding that something might be happening somewhere, it creates a sense of desperation amongst the fans who get the impression that everything hinges on who a club can sign. It does not. The cohesiveness of a team the coaches tactical awareness and dumb luck count for as much as a marque signing here or there.